Born in Fairfax, Virginia, Kayla Sarajian moved to Medford, New York, a suburb on Long Island, when she was 5 years old and graduated from Patchogue-Medford High School in 2007. Enter the serendipity of skiing. Her dad had taught her to ski when she was 11 and then a best friend’s family regularly took her to Okemo, “where I really got into skiing,” Sarajian recalled. Mountain Times: How did you get to your current job? 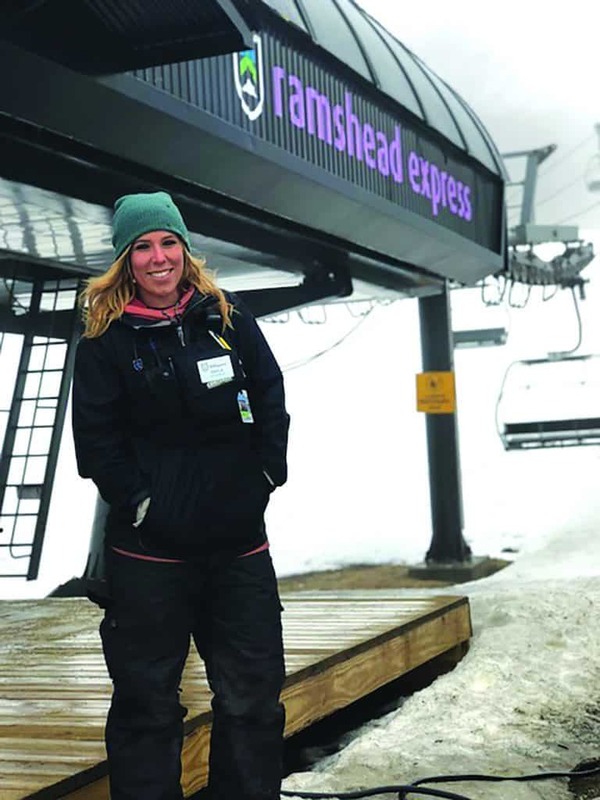 Kayla Sarajian: After I taught 4-6-year-olds to ski the first year, I moved into Killington’s seasonal ski school program and skied with about 15 kids every weekend. It was the best experience. When I decided to move to Killington for good, Nick Brylinsky (then a lift ops manager) offered me a summer position with lifts at the Adventure Center. As time passed the supervisors saw potential in me and offered me a job as a team leader in lift operations. In summer 2018 I was promoted to lift operations supervisor. MT: What are your responsibilities? KS: I share oversight of all lift operations with Ryan Crawford, who is also from Long Island and is the other lifts ops supervisor. I also train lift operators for summer and winter. In winter my days start at 6:30 a.m. on weekdays and 5:30 a.m. on weekends. Before as a team leader, every morning I hopped on my snowmobile and headed out to my area of Snowshed/Ramshead to get the lifts and the magic carpets operating. Now I oversee the entire mountain with Ryan. Whether it’s transporting operators or shoveling after a powder day, mornings are usually nonstop until we open. Luckily we have a great team of lift mechanics and electricians to help get everything set up. We’re a big family that works well together. During the day I am either in the office doing paperwork or roaming from lift to lift seeing if operators need help, assisting with lunch breaks, or just keeping them company. It’s really important when you are building a team for winter that you connect and ensure trust in all your operators because without our staff the lifts wouldn’t run! Weekends are my favorite, and this season I’ve been busy at the new Snowdon Six Express. It’s always so busy on the weekends, and I love guest interaction and making people smile. Summer time I’m at the Adventure Center – basically a repeat of winter but catching a tan while working. I make sure all attractions and the lifts are fully staffed and ready to open by 10 a.m.
KS: Getting to drive a snowmobile is definitely a perk. On weekends we have a “limited sled travel” policy so that means if I have to get to a top of a lift, I’m skiing! I find everyday working in lifts is a reward. Not many girls I know can operate huge machinery, not have a problem with getting grease under their nails, and can stand being in negative degree weather from 6 a.m. to 5 p.m.
MT: Are there other women working in lift operations? KS: There is one female team leader named Julie and plenty of female lift operators. I interact with both men and women in this department where the male to female ratio is 8 to 2. I definitely am considered “one of the guys” in mountain ops. Just because I’m a woman doesn’t mean I can’t do anything a guy can. MT: What advice would you give to women considering working in a “less traditional” ski job? KS: If you want something in life, take it. Women are a lot stronger than men think, and I consider myself to be a prime example of that. This is the 21st Century; women don’t belong in the kitchen anymore. MT: What do you think of winter and the ski-town lifestyle? KS: Winter is why I moved up here! I have a giant playground in my backyard – literally. It’s a non-stop adventure living in Killington. We are a small community; it’s great going out and seeing all your friends. For anyone wanting to move up here, I say go for it! MT: What are your favorite sports or hobbies? KS: In winter, it’s skiing. But I recently picked up downhill mountain biking and now skiing has a new competitor for my favorite sport. MT: Do you have a favorite book or video you’d recommend? KS: “Sunscreen Song,” a speech given by Kurt Vonnegut. When I found myself lost in life and didn’t know where my future was going, an old friend showed me this (it’s on YouTube), and then I made my decision to move to Vermont. Best decision of my life. MT: Any advice or words of wisdom?